Why did the last two Hulk movies fail? What female TV character is still relevant today? What are the six reactions to a controversial new sci-fi movie? What comedy star will be in a remake of a sixties cartoon show about time travel? One of the most common responses to "Geek Bits" is: "Wow. There sure are a lot of links!" So, I assume most people don't actually read or follow them. This week I've nailed it to it's final format. I run into hundreds of great blog entries, but I'm only listing the ten best links from now on. The rest will be shared from our twitter feed. What 1998 comedy-drama inspired one man to climb to the top of the Statue of Liberty? 1. The Goonies is one of my all time favorite films, which is why IndieWire's list Five Things You Might Not Know About The Goonies is so fascinating. "Chunk" came up with the idea for the film? Wow. What did you learn about the Goonies? 2. Stan Lee has had a lot of time to think about the Hulk movies and Total Film says the promlem was size. I think it was more about Ang Lee's stupid art house style, but what do I know. They hadn’t quite found the right formula with the Hulk but he’s very good in Avengers Assemble. They made him too big in the first two movies – I don’t think he had to be as big as King Kong. I think they’re gonna be OK with the Hulk from now on, though. Mark Ruffalo nailed it. Do you think Stan's right? 3. Born For Geekdon has a thought-proving piece on Why Battlestar Galactica's Kara "Starbuck" Thrace Still Matters. What does BSG's Starbuck mean to you? 5. Prometheus reviews range from "great" to "lame." Movie Reviews – Prometheus, Madagascar III, John Carter – and Ninja News! 6. 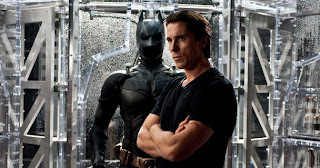 Samples of the movie score for The Dark Knight Rises are online and you can listen to them here. Surprisingly, there are no spoilers in the song titles like "Bane Breaks Batman's Back." 7. Scouring Monk has a History of Comic Book Movies from 1951 to present he manages to give short commentary on each film! A great retrospective. 8. 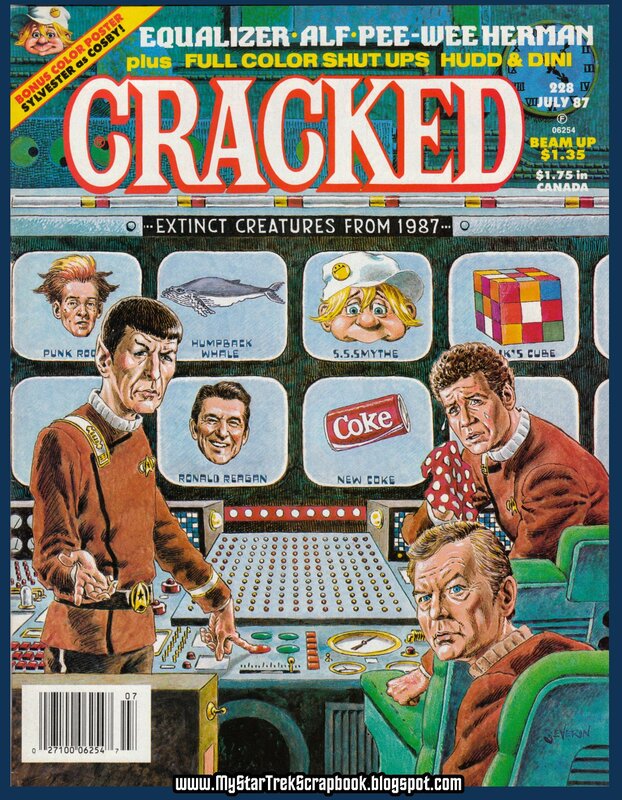 I used to read the parody magazine Cracked religiously as a kid. So, when My Star Trek Scrapbook posted scans of the 1987 Cracked Star Trek IV: The Voyage home Spoof. Jokes like "Klingfree" instead of Klingon, and naming Uhura "Uhoohah" with a massive cleavage help explain why the magazine is a distant second to MAD magazine. There are some funny jokes though. Any dog/batman puns you can think of? 10. There are plenty of women heroes in the DC universe and Comic Book Resources has a list of Women of the DCU Who Deserve Their Own Films. While their wrong on the origin of "The Question" (it didn't start as a woman) I can't argue with Katerina Graham as Vixen. All Your 'Awake' Finale Questions Answered! Do You Have Dr Who Treasures In Your Attic? What The H*** Happened To Tim Burton? After seeing The Truman Show, a film about a man who unknowingly lives on the giant set of a reality show, an Army veteran believed he lived in a TV show. He thought climbing to the top of the Statue of Liberty he would meet his high school girlfriend and the show would be ended. If she wasn't there he planned to jump to his death. "I was and am the centre, the focus of attention by millions and millions of people," he explained, "My family and everyone I knew were and are actors in a script, a charade whose entire purpose is to make me the focus of the world's attention." People with the "The Truman Show Delusion," named after 1998 film, believe that their lives are staged plays or reality television shows. There are 40 recorded instances of people suffering from the Truman Show Delusion in the U.S., the U.K. and elsewhere. Bonus Trivia Question:Who were the stars of The Truman Show? Stars were Jim Carey, Ed Harris, and Laura Linney. As for which Prometheus reaction, I guess moderate and thought the issues were too distracting. Think they finally got the Hulk right this time! The star of The Truman Show was Paul Giamatti. Everyone else was just starring in a movie about his plight to become a leading man. You got the main actors Alex, so someone else can jump in with the costars. The Avengers Hulk seems to be everyone's favorite. I'd buy that for a dollar Jeremy. You got the actors. 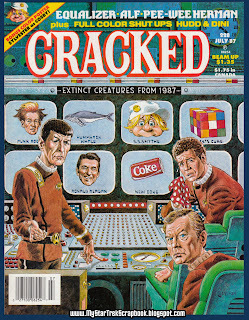 I don't know anyone who read Cracked, but I always felt a loyalty to the magazine as the underdog. Good one Tony! Paul's an underrated actor. I saw Prometheus in 3D yesterday. I thought it was awesome. Although, there could have been more mauling by aliens. I liked feeling as if I stood on an alien world. So, no matter what, they had me there. Well, an immersive experience is the essence of good filmmaking Mary. Did you see out in IMAX? Stan Lee is so damn cool. Late eighties and sharp as a tack.